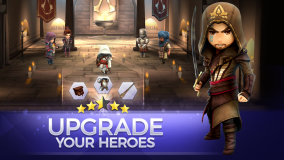 Download Assassin’s Creed Rebellion APK v2.3.1. For the first time ever, Assassin Creed Rebellion allows user to joining assassins like Ezio, Agui;lar, Shao Jun and many others. 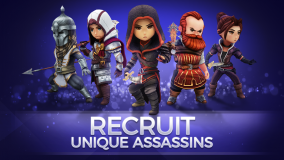 Assassin Creed Rebellion is one a kind RPG game for mobile users brought to you from the Assassin Creed universe. Now with the past memories of Animus allow the experiences from past life of different assassins and play with the character of your choosing. You can even gather up multiple assassins and forge a brotherhood to fight off against Templar’s and the oppression from Spain. User will be able to rediscover legends of the Assassin order in a new light. Now make team with up to 40 characters. These characters now not only include previous legendary character but also some new ones. For promoting your assassins to high ranks, train them. Strengthen your brotherhood forces to fight off against Templar’s. Build up and develop the fortress for your Brotherhood’s growth. 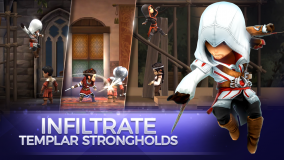 Not only increase the power of fortresses but also the skills of your assassins. The game allows you to build rooms, new crafts, equipment’s, resources and medicine for your HQ. You can also collect the DNA fragments from all around to unlock many new characters. Now send off your infiltration teams throughout Spain. Game allows you to make up your on perfect team of heroes to reach your objectives. 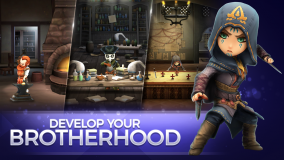 Now make your own strategies whilst using your assassins to infiltrate into Templar strongholds to foil their plans. Fight your way through in your manner. With this new game, you will be able to discover newer settings and different eras of the past. With special events you have chance to win additional rewards an unlock newer characters which are rare. Compete in the leader-boards against opponent teams from all across the world. If you manage to get to the top of leader-boards you can loot even bigger rewards. What's new in this version of Assassin's Creed Rebellion? Collect brand new heroes: Bayek of Siwa and Kensa, the Nubian gladiator!